Today, illegal immigrants violate our borders and overwhelm our hospitals, schools and social services. Ron Paul wants border security now. Physically secure the border. No amnesty. No welfare to illegal aliens. End birthright citizenship. No more student VISAs for terrorist nations. “No visas for students from ‘terrorist nations’”? Rarely has a more ignorant proposal been advanced – and it is made even worse by the fact that this is Ron Paul we’re talking about. To begin with, it is odd, indeed, for a libertarian to be invoking the concept of collective guilt: is every citizen of these unnamed “terrorist nations” to be declared persona non grata on account of the actions of a minuscule number of their countrymen? Secondly, just which nations is Rep. Paul talking about? Fifteen of the 9/11 hijackers came from Saudi Arabia: two were from the United Arab Emirates, one was Egyptian and another one hailed from Lebanon. Is Paul seriously saying that we should deport the thousands from these countries studying in the US? And why stop there? Why allow anyone from these so-called “terrorist nations” entry into the US for any reason whatsoever – just to be on the safe side? This is pandering to the worst, Tom Tancredo-esque paranoia and outright ignorance (or do I repeat myself?) and is not worthy of Dr. Paul. I have the utmost respect for the candidate, but in using this unfortunate term, “terrorist nations,” the Good Doctor undermines his non-interventionist foreign policy stance. If these are, in truth, “terrorist nations” – which most will take to mean all predominantly Muslim nations — then why not invade them, kill the terrorists, and be done with it? This phraseology gives the War Party carte blanche – and, believe you me, they’ll use it. As Murray Rothbard explained, the anti-interventionist conservatives of the 1950s made the same mistake when they jumped on Joe McCarthy’s bandwagon. The “red scare” was payback for the “brown scare” of the 1940s in which prominent conservatives were basically run out of public life on a rail for not getting with the program until Pearl Harbor. The original McCarthyite movement was directed against domestic reds, and was a sweet revenge for those conservatives who had been targeted as “subversive” and even “pro-Hitler” for being anti-interventionist during the Roosevelt era. However, it wasn’t long before the domestic witch-hunt spilled over the border and became an international armed crusade that roped us into NATO, lured us into Korea, and got us bogged down in Vietnam. It saddens me to write this, and yet I cannot be silent in the face of such a brazenly ugly attempt to cash in on barely disguised anti-Muslim sentiment, especially since his proposal would penalize large numbers of perfectly innocent people, young people whose only “crime” is to want to come to America. The Paul campaign should scrap the ad, pronto. While I support Ron Paul’s efforts to be included in the upcoming Fox debate, this does not mean that I agree with his views, consider his views to actually be libertarian, or even think he makes very much sense. I supported Paul’s inclusion in recent posts because of believing this to be the case of any candidate, regardless of what I think of their views. Unfortunately, despite his reputation for supporting freedom and defending the Constitution, Paul’s public statements and writings demonstrate that his view of the Constitution could result in a reduction in individual liberty. First off, I think what we are trying to achieve through an amendment to the Constitution is to impose values on people- that is, teach people patriotism with our definition of what patriotism is. But we cannot force values on people; we cannot say there will be a law that a person will do such and such because it is disrespectful if they do not, and therefore, we are going to make sure that people have these values that we want to teach. Values in a free society are accepted voluntarily, not through coercion, and certainly not by law, because the law implies that there are guns, and that means the federal government and others will have to enforce these laws. Here we are, amending the Constitution for a noncrisis. How many cases of flag burning have we seen? I have seen it on television a few times in the last year, but it was done on foreign soil, by foreigners, who had become angry at us over our policies, but I do not see that many Americans in the streets burning up flags. There were probably a lot more in previous decades, but in recent years it averages out to about eight, about eight cases a year, and they are not all that horrendous. It involves more vandalism, teenagers taking flags and desecrating the flag and maybe burning it, and there are local laws against that. Under the Constitutional principle of federalism, questions such as whether or not Texas should prohibit flag burning are strictly up to the people of Texas, not the United States Supreme Court. Thus, if this amendment simply restored the state’s authority to ban flag burning, I would enthusiastically support it. This is hardly the only time Ron Paul has expressed his disbelief in First Amendment rights. As I’ve previously noted, Paul has incorrectly claimed that, “The notion of a rigid separation between church and state has no basis in either the text of the Constitution or the writings of our Founding Fathers.” He has also supported keeping “under God” in the Pledge of Allegiance, has co-sponsored the school prayer amendment, and supported keeping the Ten Commandments on a courthouse lawn. Paul has both criticized secularism and claimed that the Founding Fathers envisioned a Christian America. Ron Paul’s version of the Constitution is contradicted in the writings of the founding fathers, many court decisions, and in the view of most historians. I also find it curious that Paul comes to such a restrictive interpretation of the Constitution with regards to First Amendment rights but has no problem with the ambiguities of the Second Amendment when he defends the rights of individuals to own guns. Unfortunately Paul interprets the Constitution based upon his own personal views as opposed to how it was actually written. Traditionally libertarians have opposed restrictions on individual liberty at any level of government, not only when coming from the federal government. Rights are believe to be based upon the individual, not state or local governments. Ron Paul’s willingness to tolerate violations of individual liberties as long as this comes from a state as opposed to the federal government explains why so many white supremacists neo-Nazis are backing his campaign. What is more puzzling is why any libertarian would support a candidate whose views are so inconsistent with individual liberty. In fact, Musharraf was reelected to the presidency in October. The upcoming elections are for parliament, and while Musharraf’s party will be facing off against opposition parties, the president himself is not a candidate. “He will NOT be on the ballot,” said a Pakistan scholar at Columbia University, Philip Oldenburg, in an e-mail. “These are parliamentary elections, where the contests are for a seat in the national assembly. A spokesman for Clinton, Howard Wolfson, said Clinton was referring to Musharraf’s party, not the president himself. But Clinton’s words appear unambiguously to describe Musharraf himself as a candidate. “If President Musharraf wishes to stand for election, then he should abide by the same rules that every other candidate will have to follow,” she told CNN’s Wolf Blitzer (.pdf) Dec. 28. “He could be the only person on the ballot. I don’t think that’s a real election,” she told ABC’s George Stephanopolous December 30. Ron Paul is being excluded from a debate held by Fox just prior to the New Hampshire caucus, and naturally Paul’s supporters are not happy. Fox justifies their decision by arguing that Paul is only in single digits in the polls. Paul does come closer to double digits in New Hampshire polls, and the vote for him might wind up in double digits if he either gets a bounce out of Iowa or if he has the opportunity to impress more voters prior to the vote (such as in this debate). Naturally there is also speculation that Fox has chosen their criteria in order to exclude the sole anti-war candidate. This suspicion is strengthened by the inclusion of Fred Thompson, who falls behind Paul in some polls. At this time it is uncertain whether Paul will be excluded from a debate being held by ABC. If Paul is able to come in fourth place in Iowa he will be included. I have recently given reasons as to why Paul should not be excluded and would refer back to the recent post as opposed to repeating all the same arguments here. The traditional role of New Hampshire should also be considered. Dark horse candidates sometimes establish themselves as legitimate contenders by doing better than anticipated in Iowa or New Hampshire. If New Hampshire is to have a special position in the primaries, candidates should continue to have this opportunity. Perhaps it would make sense to exclude candidates later in the primary race based upon poor performances in the early primaries, but at very least such decisions should be based upon actual votes, and not just polls. ABC’s inclusion of a fourth place finish in Iowa makes this a little fairer than Fox’s criteria but Iowa and New Hampshire are quite different states. A candidate with support among independents and libertarians could do better in New Hampshire than in Iowa. If New Hampshire is to remain a state which makes or breaks many candidates, they should not base such decisions on either the polls or the voters of Iowa. Big Tent Democrat has done the math and calculated that, assuming that the numbers from the final Des Moines Register poll are accurate, a majority of Obama’s support comes from non-Democrats. The poll shows Obama with a comfortable lead based upon their predictions of who will attend the caucus. They found that among those likely to attend, 40% are independents and 5% are Republicans. Democrats who see the Democratic Party as supporting such a specific set of policies, and feel that even Barack Obama is not pure enough for them, might see the support for Obama by independents as being bad. A Democratic Party under Obama will certainly not be radical as under John Edwards. Major political parties are not static entities which support the exact same positions from year to year. This is what has preserved our current two party system as the parties evolve to represent approximately half the voters. Democrats who see the influx of independent voters into the party must remember that the party they support could no longer win very often, either in Congressional or presidential elections. The only way for Democrats to win would be to bring in the support of independents and even some Republicans. It is possible that any Democrat could win this year, but continuing the Republican strategy of governing with 50% plus one is not a formula for long term success. If Obama has the ability to bring in independents and some Republicans this will only strengthen the party. Many bloggers, including Big Tent Democrat, have tried to disparage Obama in the minds of Democrats by raising erroneous comparisons to Joe Lieberman. There is little similarity between the two. Obama has opposed the Iraq war from the start–unlike Lieberman. In fact. on this matter it was both Edwards and Clinton who voted as Lieberman did. The antipathy towards Lieberman by many bloggers is also a result of his frequent attacks on other Democrats. Not only has Obama not been like Lieberman, but this fault would also apply more to John Edwards who has recently raised specious attacks on Obama. If Obama was a right wing Republican then naturally I would expect liberal bloggers to have reservations about a candidate backed by independents and Republicans. Obama’s record hardly justifies such concerns, and his ability to receive the votes of independents should be seen as an advantage. This antipathy towards building such a majority certainly seems strange from someone who writes under the name Big Tent Democrat. As I predicted back in November, Dennis Kucinich has finally figured out what a big mistake he made in 2004. With the second choice being important in the Iowa Democratic caucus, Kucinich threw his support to Edwards, helping him come in second place. Some such as Chris Bowers are puzzled, writing “backing away from Edwards after Edwards moved even further to the rhetorical and policy left seems odd to me.” Maybe Bowers is right that Kucinich is “an odd fellow” but he’s not a total fool. As I noted at the time, in November Kucinich figured out what a phony John Edwards is and, unlike many Democrats, is not fooled by the populist pose that Edwards has taken in order to do well in Iowa. Democratic Presidential candidate and Ohio Congressman Dennis Kucinich opened the New Year by publicly asking his Iowa supporters to vote for him in the caucuses this Thursday, and suggesting that if he did not make the 15% threshold, their second ballot should be for Senator Barack Obama. “This is obviously an ‘Iowa-only’ recommendation, as Sen. Obama and I are competing in the New Hampshire primary next Tuesday where I want to be the first choice of New Hampshire voters. Those who are surprised to see such signs of sanity from someone on the far left of the Democratic Party will be not be surprised to hear that Ralph Nader remains as delusional as ever. Ralph Nader, who helped Bush get elected by claiming that there was no difference between George Bush and Al Gore, has endorsed John Edwards, supporting his “pugilistic brand of populism.” Yet one more reason to vote against John Edwards. 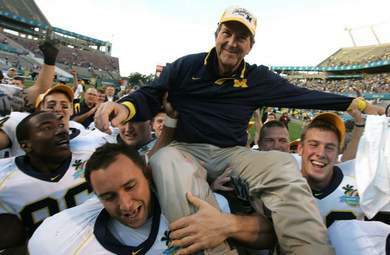 In his final game as Michigan football coach, Lloyd Carr surprised everyone and wound up being the one to bring the spread offense to Michigan. For the first time this season Carr had both Chad Henne and Mike Hart healthy and beat Florida 41 to 35 in the Capital One Bowl. Michigan showed what they could have done this year with a healthy team. Carr retires with a record of 103 wins and 36 losses. Carr has won five Big Ten titles and one National Championship. Maybe not. The most likely result of John Edwards being elected president in 2008 will be the landslide election of a Republican Congress in 2110, and the Democrats will wind up out of power for another generation. The results might not be desirable, but the nation will become united under Republican rule if the Democrats so something as insane as electing John Edwards. Let’s hope that the Des Moines Register poll is predictive. The poll shows Obama with a comfortable lead, and includes 40% of independents and 5% of Republicans among the people likely to attend the Democratic caucuses. Clinton comes in second with Edwards virtually tied with her. The question is whether this many independents actually show up, with Edwards having an advantage in that his supporters have attended the caucus before. The considerable support for Obama among independents over Clinton and Edwards provides a hint as to what Democrats should do if they want to build a real majority as opposed to imitating the Republican pattern of rule by 50% plus 1.